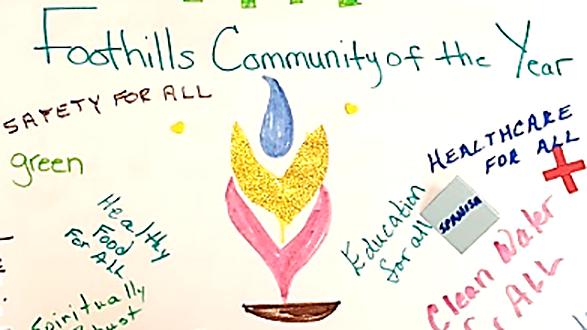 Starting today and over the next eight weeks, we’ll be sharing with you some of the future wishes and past highlights that we saw represented most frequently in the data that was collected in our 22 visioning sessions* with some 350 members, friends, and staff of Foothills. The entire body of data can be reviewed here. The Board of Trustees held a retreat before Thanksgiving to sift through this data and discern both guiding values for our congregation and concrete vision statements. We will hold a special board meeting in December to complete the process and will present the final values and vision statements** at our half-yearly congregational update meeting in January. These values and vision statements will complete the triumvirate of Values, Mission, and Vision that are the cornerstones of the large-congregation, policy-based governance structure that Foothills has been diligently working to transition into for a number of years now. This new model of governance is designed to allow a large and growing democratic congregation and its governing board to operate in an effective partnership with a strong, permission-giving ministry team to further the mission of the church. 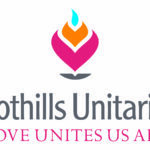 In the case of our mission, to help Foothills Unitarian Church unleash courageous love in Northern Colorado and beyond by embracing our diversity, growing our faith, and awakening our spirits to the unfolding meaning of this life. Here are a few of the highlights and values from this wonderfully successful visioning process that so many of you gave so generously to of your time and energy. We’ll share more in the coming weeks. Being included and supported in the “tangled blessings” grief group, and experiencing the courage to be small. Gather and sisterhood groups: respectful listening, commitment, continuity/familiarity and deepened relationships, shared leadership. Women’s group as a new member: warmth, hugs, welcoming. Renaming moment for the Harris family celebrating their child’s gender transition: willingness to show up, do what you can. I want everyone to feel the amount of belonging here in this church that I have found. Rediscover create/fun energy in myself and help others who may be marginalized do the same. 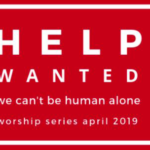 More connecting to find ways to help/support each other within our church community. *In those sessions, for those who weren’t able to participate, we were asked to share a story of the holy or transcendent in small groups, identify value words that our story embodied, and winnow those value words to a set that our small group could agree were common to all our stories. Next, we shared a memory of experiencing courageous love in action at Foothills in our small group. Then we shared our boldest wishes for the future of the congregation, and the small groups created a magazine cover from 10 years in the future of how Foothills was making news and impacting the world.